Freeport, Grand Bahama – Over three hundred high school senior girls on Grand Bahama gathered for the 2nd Annual GirlCon Organization’s one-day conference held at the Regency Theatre on Tuesday, November 20th. Young women representing the University of The Bahamas and the Government High School in Nassau were also in attendance. Launched in November 2017, GirlCon, the brainchild of Senator The Hon. Katherine Smith, was initially envisioned as a singular event focusing on the mentorship of young high school girls, and designed to encourage other women in The Bahamas to do their part in helping to develop the next generation of female leaders. “GirlCon began with a group of women who came together who believed in the vision,” explained Senator Smith. “We put together a good event last year and then we decided we needed to continue to expose young girls to the issues they could expect to face as women.” We targeted female High School seniors who were preparing to embark on the next leg of their journey into womanhood; whether that be attaining higher education, or transitioning into the workplace. 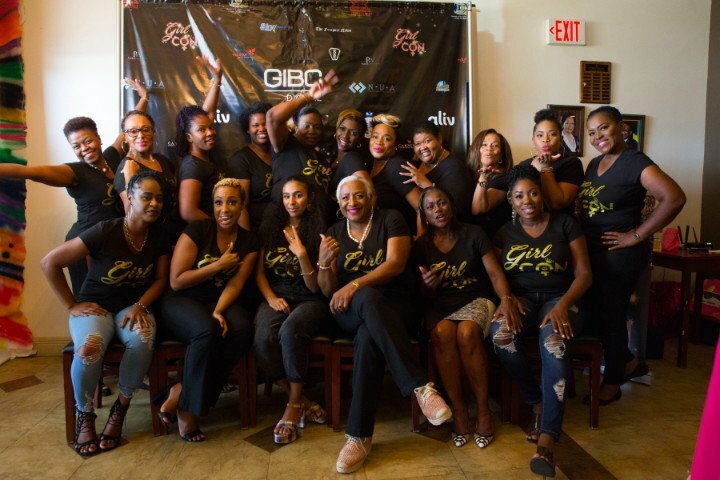 Since then, GirlCon has mushroomed into a movement and non-profit organization, which has quickly garnered the support of men and women across multiple societal spaces. “We want all of the young women attending GirlCon to have a real idea of what to expect,” said the Senator, “we want them to not only survive but to exceed their own expectations”. At the start of Tuesday’s sessions, the girls were treated to a very special greeting from Mrs. Patricia Minnis – wife of the Prime Minister of The Commonwealth of The Bahamas – who branded the overall experience as uplifting. This year’s event focused on topics such as the positive and negative impact of Social Media, Entrepreneurship, and Wellness. Helping participants navigate the perils of Social Media was Singer and Actress Angelique Sabrina who recounted her own painful and highly publicized experience with cyber-bullying along with other powerful stories of her own triumphs and challenges. Joining the singer was well known local author and storyteller Kerel Pinder, who has built her own brand telling the stories of women – including her own – through her stage plays. “If I had taken the time, when I was a young adult, to understand who I was, who God is in my life, and follow the path God had for me, I would have had a smoother journey,” Pinder continued. Hosting the panel of speakers was popular radio personality and talk show host Renee “Natural Empress” Davis who was joined by Janette Martin-Isaacs a Behavioral Therapist, Registered Nurse and President of Jemi Health and Wellness and Makeup artist and Entreprenuer Italia Williams-Wilson. The atmosphere of the Regency Theatre buzzed with joyful conversation as the girls recounted their personal highlights of the day. For Ostonya Thomas, a twelfth-grade student from Grand Bahama Academy, GirlCon 2018 will assuredly be an unforgettable event because her essay “I Am…I Can…I Will” was chosen as the winner of the essay competition. The top three essay winners, first place Ostonya Thomas, second place Alexandra Cooper and third place Sabrina Brown received prize money and a chaperoned trip to attend the 63rd session of the Commission on the Status of Women at the United Nations. Eldri Ferguson-Mackey, Girlcon committee member, gave thanks to their many sponsors who made this event possible, including Title Sponsor GIBC, Gold Sponsor IL Cares Foundation and The Ministry of Social Services & Urban Development, the Grand Bahama Port Authority, ALIV, 242 News Bahamas, Equinor, Generali, Sky Bahamas, Bahamas First/NUA, Focol, Buckeye Bahamas Hubs, ZNS, Freeport News, Carnival Corporation, EES, Keen I Media and Barefoot Marketing.